We're happy to announce that you can now get Toddler Superhero stickers! 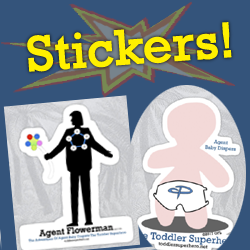 we will add new designs soon but for now, you can get either Agent Flowerman or Agent Baby Diapers stickers in several sizes for your decorating needs! We also have laptop skins so you can be the most awesome person in the room with your very own Toddler Superhero character! We'll update as we come up with more. Cheers from The Toddler Superhero Team.